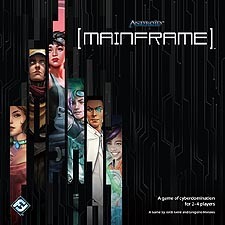 Android: Mainframe is a fast-paced strategy game for two to four players set in the Android universe. During a game of Mainframe. players assume the roles of runners, members of a criminal subculture who infiltrate cyberspace for fame and profit. Execute programs, place access points and partitions, and gain control of the mainframe.